Last night while wandering around Wal-Mart I noticed that all the Kellogg’s products where on sale. 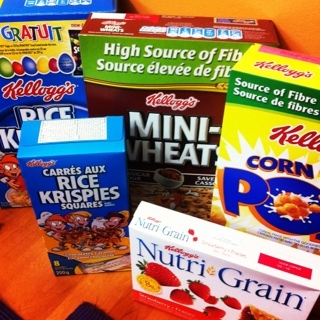 At least all the ones I had coupons for – the coupons came from the Kellogg’s Holiday Gift Box. I really impressed the cashier (and myself) when the total came to $1.08. To make this even sweeter (and more chocolaty) the box of Rice Krispies had a coupon for a FREE 200g bag of SMARTIES Eggs or 203g SMARTIES bag! I hope to try the eggs. Also, when I got home last night I had some websaver coupons waiting for me that had $1.50 off Rice Krispies Squares – hopefully they are $1.67 for a bit longer. :) I still have to use my All Bran Bar coupons – all my Wal-Mart had left was the Orange Cranberry ones – YUCK! Tried the ones in the Holiday Box and I did not like them all. Looks like I am having cereal for breakfast. This entry was posted in coupons, food, free, walmart and tagged food, free with coupons, kelloggs, walmart on March 16, 2012 by Courtnie.